The Kenya Rugby sevens team on Friday night shone their way to the round of 16 at the 2018, World Cup with a 19 -7 win over Tonga in the preliminary Round of 16 at the AT & T Park, San Francisco, USA. Coming to the match as favourites, Kenya found themselves trailing in the opening six minutes after Tonga’s Sosaia Tokai sneaked through the centre to touch down under the post. Samiu Muna converted for a 7-0 lead. Kenya were tactical in the second half piling their Weight in the other half and this paid as Oyoo once again paced away for his second try right under the post. 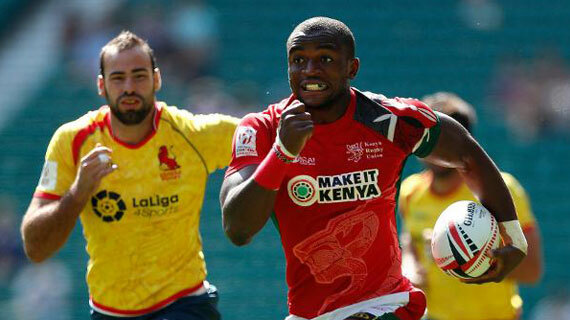 This time Sammy Oliech’s conversion was accurate to pull Kenya to a 12-7 lead. Injera sealed the day for Shujaa with an Eden Agero conversion as Shujaas sailed through to the round of 16 with a 19-7 win. Kenya will face Scotland in the round of 16 on Sunday.